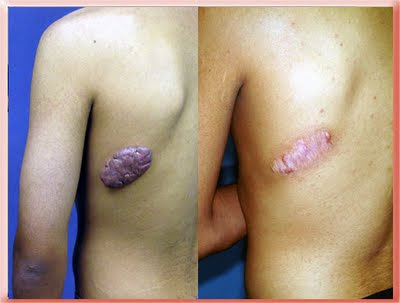 Keloids are large sometimes dumbell shaped scars that grow out of the confines of the original wound. Most chest and back keloids are caused by acne that creates inflamed scars. They are most common in Afro Americans but occasionally are found in Hispanics and Asians. Keloids do not respond to silicone sheeting. Virtually all keloids that are cut out will return within 2 to 3 months if steroids and pressure are not applied after surgery. In most of these cases radiation is used to prevent recurrence especially if the patient cannot return for weekly office visits or the body area involved is not amenable to the application of pressure by a garment, for example keloids over the breast bone between the breasts. Although the exact skin condition prior to keloid formation cannot be reached vast improvement is possible. If the keloid is causing a functional problem such as affecting range or motion or has a history of recurrent infections its removal is covered by health insurance. In California state laws mandate coverage of the removal of all visibly large keloids. This 27 year old 5′ 109 lb patient had a keloid on the central upper chest. This type of keloid cannot be completely removed at/by surgery. If the surgeon attempts to do so he/she will be unable to close the resulting wound and such open wounds increase the risk of recurrent keloids. In this case the keloid was debulked leaving some of the surface skin so that the resulting wound could be sutured closed. 4 radiation treatments were then applied to the area over the course of 1 week beginning later on the day of surgery. This was followed by the application of medicated tape to the area for 8 months to result in a flat soft scar. The after photo was taken 1 year after the surgical debulking. Most recurrences if they happen will do so 1 to 3 months after surgery. This treatment protocol was imperative to prevent recurrence of the keloid. This 26 year old developed a chest keloid from a pimple 8 years prior to the before photo. The scar itched and felt tight with movement. The keloid was shelled out leaving a thin layer of superficial skin to allow closure. After radiation and months of medicated scar taping he had this result 1 year after the surgical debulking. No further maintenance treatment is required. This 11 year old girl with a large chest keloid could not be given radiation because her breasts had not yet developed. The after photo was taken 1 year after surgical debulking followed by pressure garment and medicated tape application for that entire year. This 17 year old with a large back keloid had complete removal of the keloid and radiation treatment afterward. Non-compliance with taping after surgery allowed the scar to widen but there was no recurrence after 6 months. The options to prevent recurrence are compression garments, scar injections, medicated tape and weekly office visits vs. radiation and medicated tape. Some areas like the over the breast bone between the breasts are just not amenable to pressure garments and some patients live too far away to come in for weekly office visits. Those patients have to go the radiation route. If the keloid is large enough and/or the surrounding skin tight enough you will not be able to have the keloid completely removed. In that case it is shelled out and some of the overlying skin removed. The highest risk then is incomplete survival of the shell skin. This usually does not affect the end result but can prolong the recovery period. The benefits are not having a raised, hard scar that may itch, periodically get infected, interfere with movement or be visible through your shirt. If the radiation route is chosen radiation treatments begin within 24 hours for a total of 3 treatments. If the pressure garment route is chosen scar injections are performed at and 1 week after surgery. Sutures are removed at 10 to 12 days and the pressure garment is then applied at all times except when bathing for 3 to 6 months. Initial office visits are weekly and then are gradually extended to every 2 to 3 weeks.